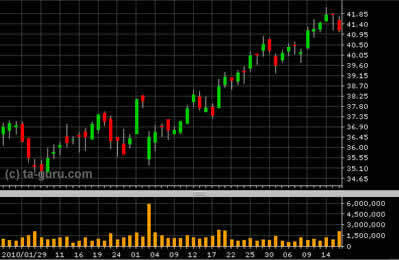 Candlestick, like a bar chart uses values of open, high, low and close to display chart data. The central part of the element (rectangle determined by values of open and close) is called the body. Thin lines that represent the range of minimum and maximum values (low and high) are called shadows. When the open price is higher than the close price, body is filled with color (usually red). Otherwise the body is not painted or it is painted in green. This way you can easily spot open and close, which is essential for this type of chart. Longer body indicates that the buying or selling pressure is higher. Thus, the body that is not colored has close value significantly above the open value, which means that the buyers were more aggressive than sellers. In the case of colored bodies, close is well below the value of open and this indicates that the sellers were more aggressive than buyers. Marubozu is a candlestick with no shadows. Non-colored body tells us that the buyers controlled trading from start to finish. For colored body the opposite statement is true: sellers controlled the trading from start to finish. Length of the shadows can give us information about the trading. Elements with short shadows indicate that the trading was close to the value of opening or closing. Candlesticks with large upper shadow and a small lower shadow tell us that most of the buyers were more aggressive than sellers. But at some point the sellers still managed to lower the price and reduce the value of close. For candlesticks with a large lower shadow and small upper shadow, the opposite statement is true: the sellers were dominant, but buyers were able to increase closing price at the end. A special case is a candlestick that has a small body, and almost equally long shadows. It is called a spinning top, and indicates that both buyers and sellers were aggressive, but no one has managed to prevail. Doji is a candlestick with almost the same values of open and close. So it looks like a cross. When doji appears after a long non-colored candlestick, this means that buying pressure weakens and probably soon will be trend reversal. For colored candlesticks opposite logic is applied: appearance of doji candlestick indicate weakening of sales pressure. Dragon Fly is doji which has the open, high, and close approximately equal, but value of low deviates from these values. So candlestick resembles the letter T. This doji indicates that sellers dominated the trading, but at the end buyers were able to return price to the original price level. The appearance of dragon fly candlestick in a long downward trend or after a colored candlestick with long body can indicate trend reversal and forming of bottom. Gravestone candlestick has open, low and close approximately equal, but high value deviates from these values. It looks like a reversed T, or as a mirrored dragon fly. The opposite logic is applied for gravestone: when it appears in a longer upward trend, it may signal a trend reversal. One of the figures that are commonly found in the charts as indicators of trend reversal are morning star and evening star. Morning Star refers to reversing of downward trend and evening star on reversing of upward trend. Candlesticks are very good for displaying data in compression, but they have one flaw: they can not show how the price moved during the period determined by chart compression. Thus, for example in the daily candlestick chart, each candlestick is relating to one day. You can easily spot price at the opening and closing, maximum and minimum price for the day. But you can miss some important movement inside candlestick: for example double top pattern which could be signal for trend reversal.